Entry to the Reception of Rashtrapati Bhavan mansion is through the Forecourt. 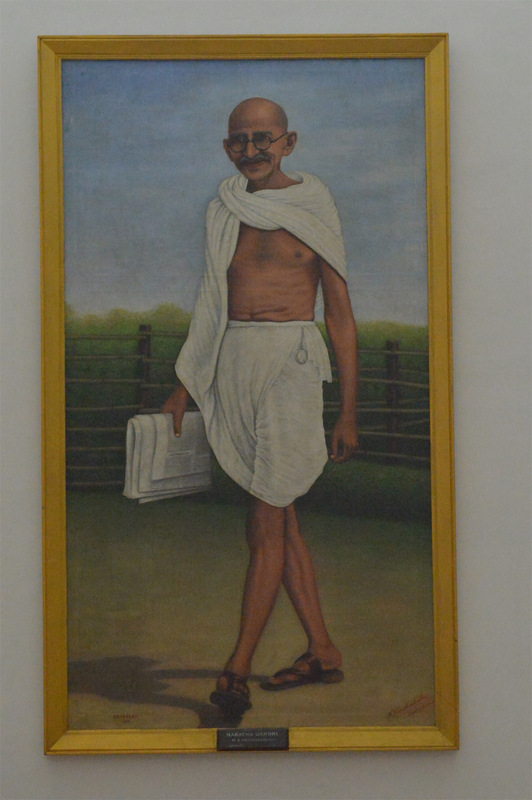 As the visitors steps inside the building of Rashtrapati Bhavan, they are greeted by a life size oil on canvas painting of the Father of the Nation, Mahatma Gandhi. The left wall of the room has a photograph of the North and South Block of the Secretariat Building captured beautifully by Amit Pascricha, right in the middle of which the Rashtrapati Bhavan's Central Dome is visible. 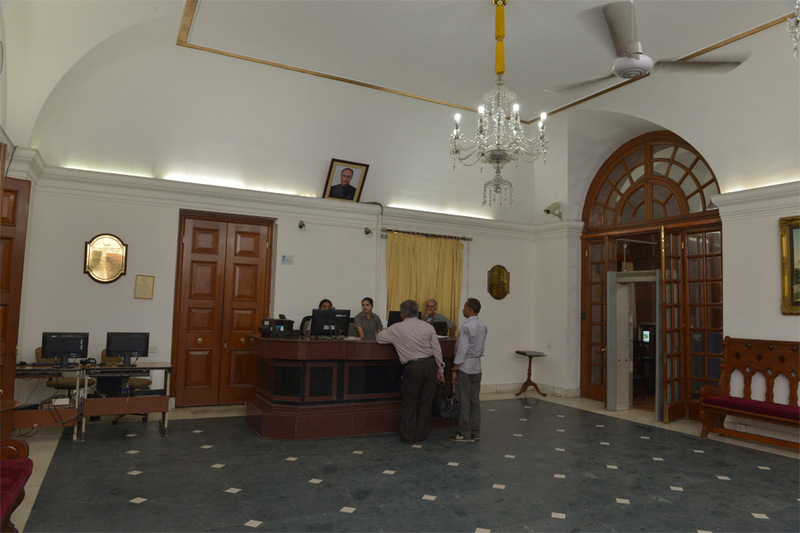 Visitors who enter Rashtrapati Bhavan go through a detailed security check at the Reception. They are photographed for a temporary pass which allows them entry inside the main building and other areas. It is also to be noted that cameras, phones, electronic devices, eatables and other personal belongings are not allowed inside the premises of the Bhavan. Visitors are requested to submit their belongings at the Reception and collect them on their way back. This procedure of entry and security check is made easy by the warm and welcoming Officers of Rashtrapati Bhavan. One is told at various points that substances that are not allowed inside the premises include flammable objects, weapons and the like. 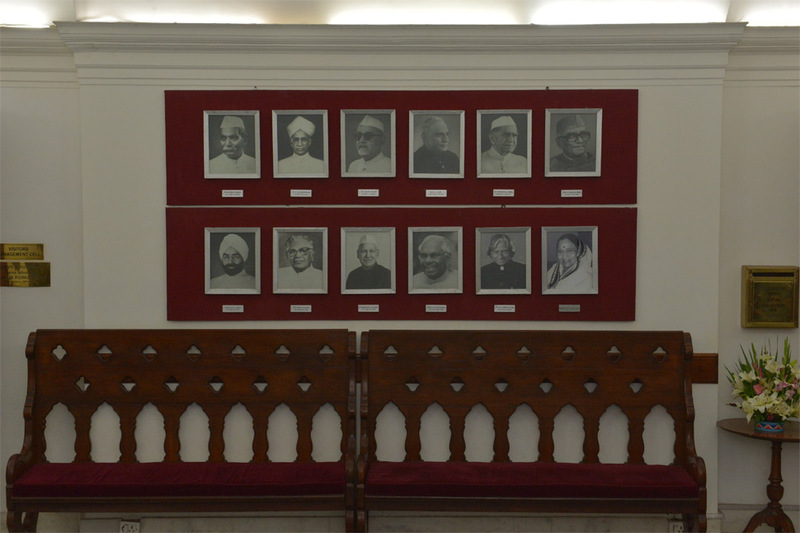 A wall of Rashtrapati Bhavan's Reception area is adorned with the photographs of Former Presidents of India. It is informative as the tenure of each president along with their names is mentioned. Also, a documentary on Rashtrapati Bhavan runs on the LED screen affixed to the wall. A huge 3D image of Rashtrapati Bhavan Forecourt with the President’s Bodyguard is also displayed inside the Reception Hall. 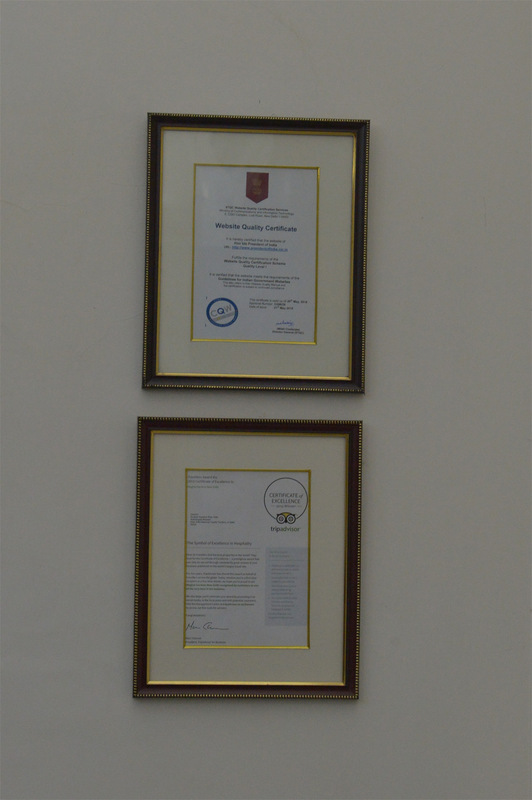 One can also see the display of Certificate of Excellence Awards that were conferred upon Rashtrapati Bhavan at various points of time. 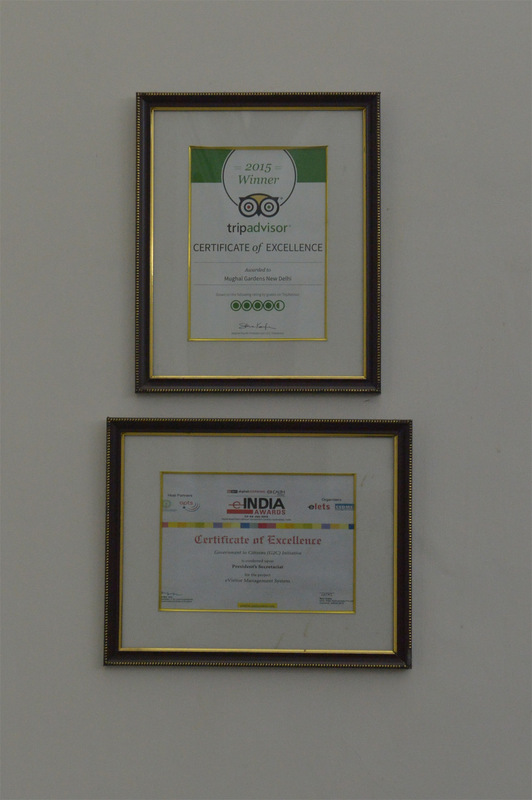 These include Trip Advisor’s Certificate of Excellence awarded to Mughal Gardens for the year 2015, eIndia Certificate of Excellence for Government to Citizen (G2C) initiative by the President’s Secretariat for eVisitor Management System. The Reception also has on display the Website Quality Certificate by STQC Website Quality Certification Services of the Ministry of Communication and Information Technology that has been awarded to the website of Hon’ble President of India www.presidentofindia.nic.in. For the convenience of the visitors, Rashtrapati Bhavan has also provided for a Curio shop. This was inaugurated in the year 2013 and is run by the President’s Estate Cooperative Stores Ltd. It has a display of articles and souvenirs that visitors may take back as a remembrance of the presidential palace. The souvenirs include a variety of items ranging from table clocks, office stationery, Rashtrapati Bhavan mementoes, tee-shirts, magic coffee mugs, fridge magnets, magnetic bookmarks and much more. It also has on display the books of Rashtrapati Bhavan multi-volume documentation series - Thoughts and Reflections; Selected Speeches of the President Vol. I, Vol. II and Vol. III; The Dramatic Decade; The Turbulent Years: 1980-1996; Abode Under the Dome; Winged Wonders of Rashtrapati Bhavan; Indradhanush; Right of the Line: The President’s Bodyguard; and The Presidential Retreats of India.The multi-volume documentation series, initiated during the current presidency, seeks to capture for posterity the various facets of life in Rashtrapati Bhavan and the Estate. A Visitors Management Cell is also located at the Reception for facilitation of visitors. Suggestions at the Rashtrapati Bhavan are always welcomed. For this purpose, a suggestion box has been placed at the Reception.